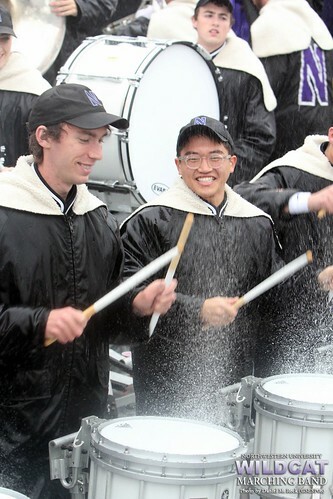 AUGUST 20, 2012 — EVANSTON, ILL. — Dripping with “heavy dew,” the snare drummers of the Northwestern University “Wildcat” Marching Band evoke performances of Blue Man Group. Geysers of water launch from the drum heads as they play, drenching themselves and everyone nearby on a particularly wet Saturday afternoon last fall. They’re all smiles. It is one image of several shot by Daniel M. Reck to be showcased in the August issue of School Band and Orchestra magazine. 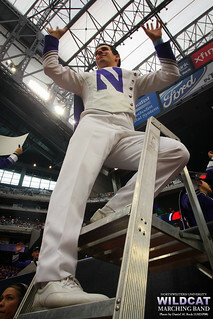 “Surrounding yourself with talented people is essential in running a program, especially for a marching band,” Daniel J. Farris, director of athletic bands at Northwestern University, says in the article. “It’s been a privilege to work with Mr. Farris, first as a student, and now as part of the band’s staff,” says Reck. He has been the Director of Web Media for the band since 2007, which includes producing the band’s website, monitoring its social media, and working as a member of the band’s professional photography team. Reck's colleague, Director of Photography Tom McGrath, also contributed images including the issue's cover. In the article, “Balancing Tradition and Innovation,” Farris and Director of Bands Mallory Thompson are interviewed extensively about their work as music educators and how the Wildcat Band as an all-volunteer ensemble encompassing nearly every major on the Northwestern campus creates a vibrant educational program. The students “are very nurturing and accepting of their peers, which creates a positive energy within the group,” says Farris in the article. Reck’s images of the tenor saxophones playing the fight song, and drum major Michael San Gabino’s Wildcat Growl, both at Reliant Stadium during last season’s Meineke Car Care Bowl of Texas, illustrate that positive energy. “As a photographer, and as a student affairs professional, it’s important to me to highlight students creating success, supporting one another, and also having good clean fun,” says Reck. 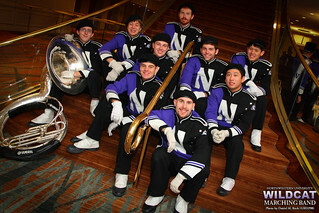 There were plenty of happy scenes to capture during the bowl trip, including the unposed photo of the sousaphone section—though it looks like it could grace a hip album cover—while they waited to play “Go U, Northwestern!” for the team at their hotel before the game. “Supporting the team, no matter what, has been a tradition that will never die,” says Farris in the magazine. “It’s great to support the students by showcasing their accomplishments,” he says. It’s fitting then that one of the images featured in School Band and Orchestra was Reck’s photo of the band’s senior class, rain-soaked but smiling, running onto Northwestern's Ryan Field while the rest of the band formed a tunnel and played the fight song at the conclusion of the final home game of the season. “That’s a great Wildcat tradition, a great celebration of student effort, perseverance, and success,” says Reck.